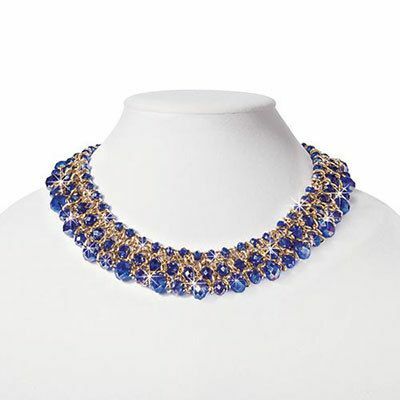 This Shimmering Azure Necklace is regal! Faceted azure blue crystals feature a shimmering aurora borealis finish for a dazzling effect, suspended within a web of gold-tone metal chain. Lobster claw clasp. 17½"l.
It is absolutely beautiful. What I don't like about it is that it doesn't lay flat on you. Acts as though the beading work is too tight so it scrunches up. Otherwise it's stunning under high intensity lighting like in a casino. Absolutely DAZZLING. I love it.